Zach just arrived on a transport from California, January 26th, 2014, rescued from a shelter with a high “kill rate”. On his way to a foster home, when he was taken out of the truck for a bathroom break, he slipped out of a harness. The harness had seemed secure, but it just popped off without much effort. Zach’s foster, Cheryl, called me within an hour of his escape, but I wasn’t available to search for him right away. 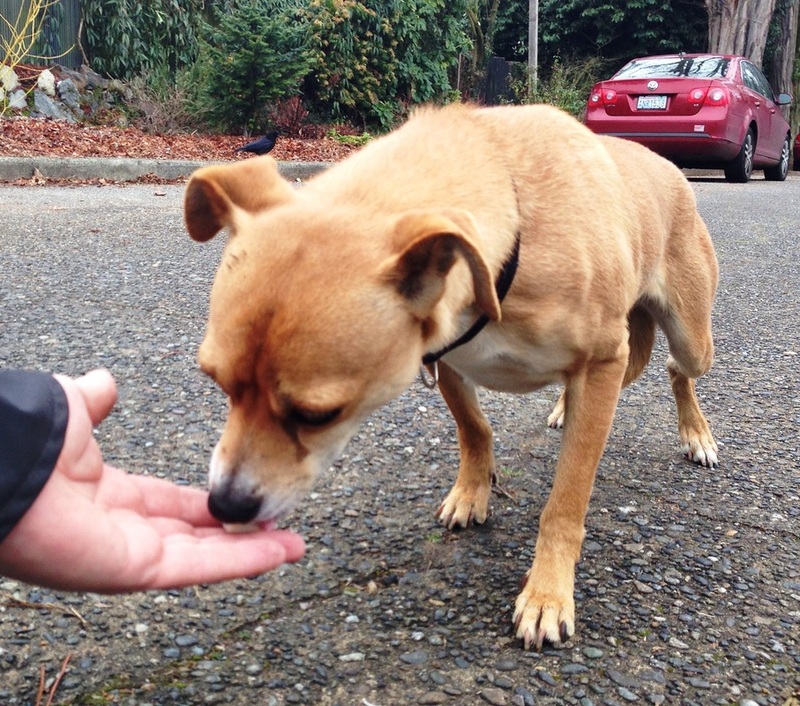 She had chased him around the U District, down 17th to 45th and then up to Ravenna Park. Cheryl had lost him just before sunset, and she was worried about Zach being out in the cold all night since he is a 20 pound Chihuahua mix acclimated to sunny California. I told her that smaller dogs had been out for days in much colder weather and not suffered any physical damage or health impacts. I told Cheryl that Kelsy and I would be out to search for Zach in the morning. In the meantime, I set up a craigslist ad for Zach, and also a Facebook page dedicated to him. From craigslist, I got a tip that Zach had been seen 30 blocks NE of the escape point, just after midnight. Before Kelsy and I got out there in the morning, we received another tip that Zach had circled back to Ravenna Park, just eight blocks north of the escape point. I started Kelsy on the scent trail using the Zach’s harness as a scent article. Kelsy worked the scent trail without a clear direction of travel. The scent wove back and forth and looped over itself. We followed the scent trail for about an hour, meandering through the park to the east, and then into some apartments. Then we got a tip that he had been seen more recently back near the middle of the park, near the earlier sighting. It appeared Zach was running in circles, which is common for lost dogs. I start Kelsy on the scent at 18th and 58th, where he had been seen two hours earlier. Within a block, Kelsy and I ran into private property, where Zach dashed through, but we had to stop and get permission. As we came out to the street to knock on the door to get permission to search, Zach trotted down the sidewalk right past us. I pulled Kesly back, so she wouldn’t spook him, and I called Cheryl. I followed Zach from a safe distance, but by the time Cheryl arrived, Zach had cut through another yard where I needed permission to follow. While we looked for him at the point last seen, 17th and 58th, Cheryl got a call that he was five blocks east. She drove over to investigate, and soon I saw her driving slowly back, following Zach as he returned to his favorite spot at 17th and 58th again. He may have run that loop dozens of times that morning. With Kelsy stowed in the car, I tossed out chunks of cheese for Zach while keeping my distance and avoiding eye contact. This caught his attention and stopped him from running. Some bold crows swooped down to steal his cheese, and I had to toss it very close to Zach so he could get it before the crows. Zach liked the mozzarella, and I was able to sit down in the middle of the street, with my back to him, and draw him closer by throwing the cheese less far each time. As I was luring Zach closer, a large white cat that lived at a neighboring house started to creep up behind Zach as if he was going to attack. I had to shoo the cat away so he wouldn’t scare Zach. Within minutes, I had him eating out of my hand. Most people would have tried to grab him at that point, but I knew from experience that a sudden movement could spook him and ruin our efforts to catch him. I ran out of cheese, and I opened a can of dog food Cheryl had given me. He ate the dog food out of my hand, and I was able to pet him a little. Cheryl had to divert people who saw me sitting in the middle of the road and wondered if I needed help. Keeping people from spooking Zach was a challenge for the next two hours. We had stopped Zach from running, but then he was full. He laid down in the landscaping near the street for a nap. Cheryl drove home , forty minutes away, to get Jimmy, a Chihuahua mix that Zach new from their time together in the California shelter. Zach had been trapped as a stray in California, and he had escaped from people twice before and been recaptured. He had learned all the tricks people usually use when trying to catch a dog. I knew we needed to be patient with him. Hurrying the process would only make it harder. When Cheryl returned with Jimmy, he was shivering from the cold even though he wore a sweater and a jacket. Jimmy seemed calm, although he shied away from me at first. I spent a few minutes getting to know Jimmy, and then I sat in the middle of the street with him. Zach definitely noticed Jimmy, and he watched as Jimmy climbed up in my lap to keep warm and be petted. Zach got up from his napping nest in the landscape and came to investigate Jimmy. He sniffed at his friend as I petted Jimmy and ignored Zach. Soon, Zach nudged my hand and demanded I pet him instead of Jimmy. Still, I didn’t rush it because I knew Zach was mine at that point. I petted Zach all over, under the chin, in the lumbar area where most dogs especially like it, but not on top of his head. I showed him the slip lead as I petted him. He seemed to recognize that I was going to put it on him. I could tell he had just a half-second notion of avoiding the leash, but then he relaxed. I slipped it over his head, tightened it up, and he was mine. Just for safety, I ran the leash around his chest and back through the loop again. In this arrangement, if he pulled away, the leash would tighten around his neck and around his chest. There was no way he could escape at that point. We loaded Jimmy and Zach into the truck, and I gave Cheryl a few pointers to avoid future escapes. I thought Zach was a good candidate for a GPS collar, like the one I have on my little Fozzie, who likes to run free. Dogs in rescue, making transitions from shelters to transports to fosters to adopters, are at a higher risk of running away because they experience elevated anxiety with strangers in strange places. I have a spare GPS collar ready for dogs that I capture, just in case they escape from me. Also, I have put together a tip sheet for rescue dogs going through these transitions. It is available at a link on my web page and can be shared with anyone dealing with dogs in these high risk situations. Most escapes are avoidable if you anticipate them and take precautions. Hopefully, Zach will have no more adventures of this sort, and he will find a new, permanent home where he can be safe.